A True Story of Kidnap, Murder and Flight in the Indian Lands of the Alle-Kiski Valley, 1792. SPECIAL NOTICE: Massa's Diary is now available for you to own! Originally published in 1825, this reprint edition details Massa's life on the Allegheny frontier during the years 1790-1794, including her famous capture and escape from the Indians. In association with Amazon.com. PROLOGUE--Massa Harbison and her husband John came to Western Pennsylvania as part of a mass migration of Revolutionary War Veterans and their families who were to take up residence in the "depreciation lands" as payment for their wartime service. The depreciation lands were located north of the Ohio River and west of the Allegheny and were named as such because the land was to be given to veterans in compensation for the depreciated currency in which they would have otherwise been paid. The settlers couldn't cross over to their "Promised Land," however, because the Indian Nations stilled controlled the lands west of the Allegheny. 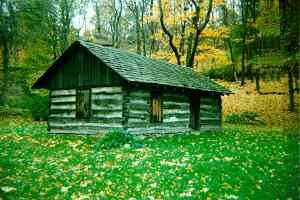 Massa and John settled somewhere along Chartier's Run in Westmoreland county and lived in a simple cabin, a replica of which now stands across Route 56 from Valley High School (pictured above--additional photos are linked to throughout the text). As the Indians became more aggressive and crossed the river to attack the settlers, whole families moved to Reed's Station--a makeshift fort composed of individual cabins gathered behind wooden palisades--which stood at the present site of River Forest Golf Course across the Allegheny River from Freeport.